Question: How do I use my Power Swabs® teeth whitening kit? Answer: First you detach a Stain-Out Swab™ from the tube. (Click here for more information on how to open a Power Swabs tube.) Rub this swab on your teeth in a circular motion for two minutes to remove deep stains and rehydrate the enamel. After waiting for 30 seconds, do the same with a White Swab Ultra™ for two minutes to whiten your teeth. Question: Can I use the White Swabs Ultra™ before the Stain-Out Swabs™ have completely dried? Answer: You can still use the White Swabs Ultra™ before the Stain-Out Swabs™ dry. 30 seconds is all you need to wait between applications. Question: What should I avoid doing after using Power Swabs® teeth whitening? Answer: Avoid eating, drinking and/or smoking for 30 minutes after the Power Swabs® gel has been applied in order to see maximum results. Question: How long will this teeth whitening last? Answer: Power Swabs® is formulated to produce a long-lasting* whiter, brighter smile. Clinical studies and other teeth whitening reviews have shown that teeth remain whiter than baseline for at least 6 months after the use of one Power Swabs® kit. 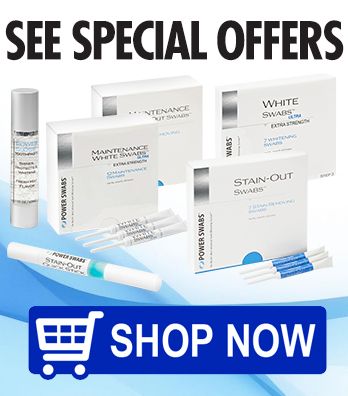 Question: What are the maintenance whitening swabs used for? Answer: Although Power Swabs® produces long lasting results*, we suggest using the maintenance kit once a week after using the initial seven-day kit to help maintain your brighter, whiter smile. Question: Is the solution used in Power Swabs® safe? What if I swallow the solution? Answer: Power Swabs® teeth whitening swabs are designed and clinically proven to be safe for all types of dental work, including the whitening of caps, crowns & veneers, and there are no known risks for swallowing the amount of solution contained in one swab. In the event of an emergency, seek immediate medical help or contact a local poison control center right away. Question: Does Power Swabs® have any negative effects on teeth, gums or enamel? Answer: Clinical studies have shown that Power Swabs® is safe for teeth and gums and do not damage enamel. Question: Can I use Power Swabs® if I’m pregnant? Answer: It is unethical to perform cosmetic clinical studies on pregnant women. As a result, we do not advise pregnant or lactating women to use Power Swabs®. Question: Can children use Power Swabs®? Answer: Even though Power Swabs® is designed to be very safe, we recommend that children under 12 years of age do not use this teeth whitening system unless advised by their dentist or physician. Question: What does the product contain? Answer: Stain Out Swabs™ contains a special blend of proprietary detergents that deeply clean the teeth’s enamel and remove stains. White Swabs Ultra™ contains a bleaching agent that significantly whitens teeth during application. Question: Who invented Power Swabs®? Answer: Dr. Martin Giniger invented the Power Swabs® teeth whitening system in 2008. In more than three decades as a dentist and working in the oral care industry, Dr. Giniger saw what worked and what didn’t and set out to create a teeth whitening product that’s fast, easy, and convenient with minimal to no sensitivity. Click here to learn more about Dr. Giniger. Question: How do you pronounce Dr. Giniger’s name? Answer: It sounds like “vinegar” but with a "G" in the front! Question: What does “risk-free” mean? Answer: On our radio and television ads, we use the term "risk-free" to describe how we stand behind our products. Risk-free means that you can get your money back if you’re not completely satisfied. At Power Swabs®, we provide a 30-day money-back guarantee. Click here to view the full Power Swabs return policy. Question: How do I contact the Customer Service department? Answer: You can call 1-800-535-4693 or email customercare@powerswabs.com. Question: Do you charge tax on Power Swabs® products? Answer: In the United States, there is no additional sales tax except for orders shipped to New York State. The exact amount of the tax differs from county to county and will be displayed during checkout. Question: How much is shipping and handling? Answer: Shipping and handling fees vary as they depend on product size, weight and quantity. You will see the cost displayed during checkout. Currently, Power Swabs® offers free shipping on orders over $50 domestically as well as on other special promotions but promotions are subject to change at any time. Answer: Returning products to us is both easy and convenient. Please click here for our full policy on returns.